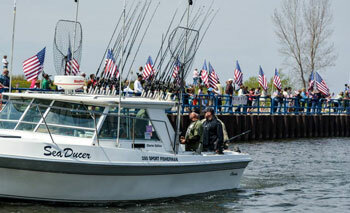 In May of each year, Tight Lines for Troops, a charity fishing tournament for Michigan's disabled veterans, is held from the port of Manistee, Michigan. 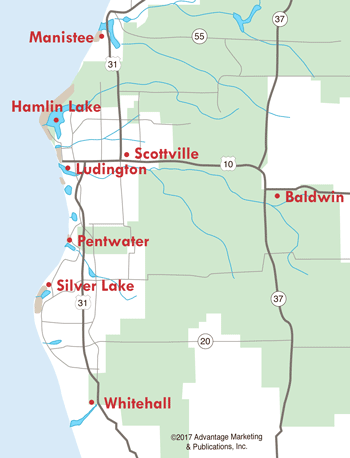 First held in 2010, the idea for the tournament was the brain child of Bob Guenthardt, a Manistee County charter captain, former Ogema of the Little River Band of Ottawa Indians, and a veteran of the U.S. Army. Sponsored by the City of Manistee, Little River Casino & Resort, Manistee Area Fishing Boats, and Seng's Marina; proceeds from the event benefit the Brain Injury Association of Michigan, Paralyzed Veterans of America, Michigan Chapter, and the Manistee County Veterans Endowment Fund. The event is free to veterans and priority for participation is given to Purple Heart recipients, Disabled Veterans, and POWs. Veterans pay no charter fees or entry fees, and are provided with a box lunch and dinner banquet on fishing day. In addition to the charter boat fishing opportunities, a Pier, Shore and River Division offers a chance for veterans to fish from the piers or go wading or canoeing in the river. Manistee recently completed several accessible fishing piers along the river. 5pm - Mandatory registration dinner for all captains and all Tight Lines participants of Boat and Shore Division- First Street Boat Launch area. Events are listed according to the information available at the time of the most recent update to this story. The schedule is subject to change. 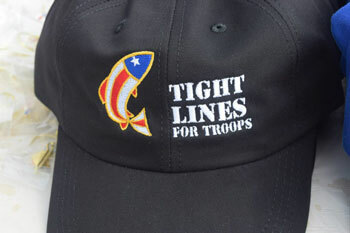 For more information, see tightlinesfortroops.com or call (231) 723-7975.